Woo-hoo!!!! Summer is here (in the Northern Hemisphere)!!! I hope everyone is out enjoying the water on your Glen-L home-built boats - or working on your current boatbuilding project and anticipating the day when you'll have your first day out on the water with her - or at least dreaming of the Glen-L boat you ARE gonna build, soon! Gayle and I and some of our local friends who'll be joining us this year, and I suspect ALL of our extended friends whom we've met through the past four Gatherings of Glen-L Boatbuilders are really looking forward to Gathering 2011 ("G5" as the "insiders" like to call it). G5 will be here before you know it, and we sincerely hope that as many of you who can set aside a few days at the end of the summer will join us at Hales Bar Marina in Tennessee September 16 - 18. Last year was the first at this location, and whether you have a boat ready for the water or not, you don't want to miss staying in one of the floating cabins, or at least making a day trip out to enjoy rides on all manner of spectacular water craft and enjoy the sumptuous cooking offered up by our fellow boatbuilders. CHANGE; change is good, right? We hope you'll all look forward to seeing some significant changes on the Glen-L.com website in the next few weeks. Don't worry, all of the great information, photos, and resources currently on our website will continue to be available, but we're making it much easier to navigate and quickly find exactly what you want, AND we are adding some great new features, too (which I can't tell you about yet…). Stay tuned! 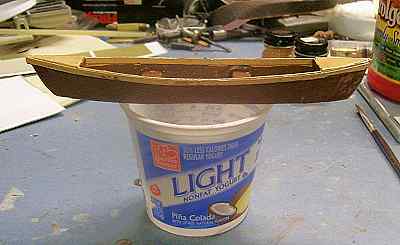 "...you should never be afraid to try...."
I am pleased to write a review of my Glen-L Marine MiniMaxed boatbuilding experience. Admittedly, this review is being written approx. 48 years after construction was completed, but it is my hope that the reader will persevere in reading what I have offered. Included within this story is what I believe to be some important life lessons that I simply could not have provided immediately upon construction completion. Therefore, if what I have written imparts some wisdom to you, then my effort will have achieved its intended purpose. At the time I contemplated this building project I was a young man, certainly not a woodworker or professional craftsperson. I was just an average kid who had a youngster's dream of building this particular boat. 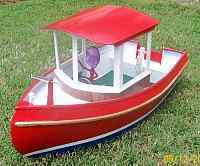 As a precursor to this discussion, I must admit to you that although the MiniMaxed was the first boat that I ever built, it was not the last. My dreams of building a boat began when I was about 14 years old, back in the "old" days around 1962. I seem to recall (hey - it was a long time ago!) a Glen-L Marine advertisement in Popular Mechanics, or some other similar magazine, challenging the reader to experience the advantages of building one's own boat. Compelled to embark on such an adventure, and seeking to satisfy my curiosity, I mailed a note to Glen-L (there were no computers and certainly no websites back then) and received a reply with a listing of boat plans for sale. Seemingly without reservation, I quickly evaluated whether I could accomplish such a feat - to the affirmative - and chose the 8' MiniMaxed, as I believe it was called back then. I saved my hard-earned money, perhaps as much as $8, and sent for the plans and instructions, eagerly awaiting their arrival. 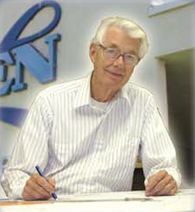 This month's Glen-L Boatbuilder of the Month is Ron Krueger, of Wilmington, North Carolina. 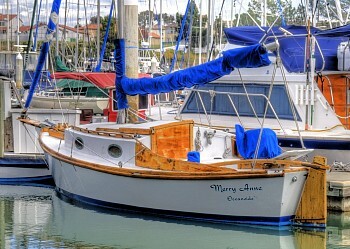 Ron has built several Glen-L boats, starting with a scale model of the Malahini, built at 15% scale of the full-size craft. 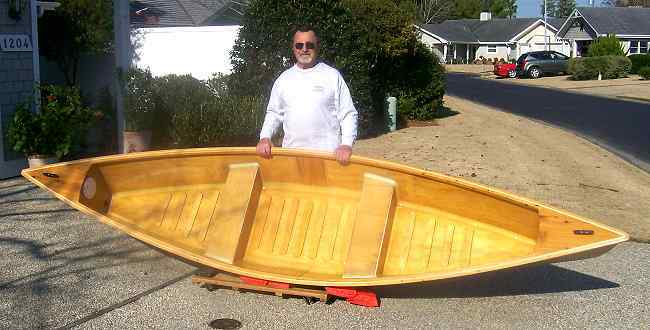 After that, Ron built a ¼ scale model of the Tubby Tug, and now Ron has completed his first full-sized Glen-L boat, the Pirogue. Of course, he also made a model of the Pirogue, too, "just for fun." Be sure to visit the Customer Photos section of the Glen-L.com website to see all of Ron's photos of his builds, and to read the tips he shares which will help in the building of any of our Glen-L boats. It had been a delightful long weekend on Kentucky Lake. We had towed SeaQuinn the 150 miles Thursday night, dropped in and then spent the next three days cruising the Lake with no particular agenda other than to relax. But now Sunday evening was approaching and we would be anchoring out for our final night and then returning Monday morning. The evening forecast had called for southerly winds 10 to 15 mph. With that in mind I choose a cove, which offered protection from the open lake channel as well as the predicted southward breeze. We were fairly exposed to the west but because of the forecast it wasn't a big concern. As the sun receded the wind had dropped to not much more than a gentle sigh. As usual, the boat's shallow draft allowed me to slip in close and crowd the shoreline. The hook was dropped in 8 feet of water and I had allowed the windlass to pay out enough rope to hold us off the bank if the wind decided to enforce its will. We settled in for a little reading and movie on DVD. About 11:30pm we withdrew to the berth and allowed the utter quiet to hasten our sleep. About 1:30am I was awakened by distant thunder. As I lay there partly awake listening for other hints of changing weather, I realized the wind had increased although it was still fairly mild. Glancing out the berth's portlight I could tell it was out of the West not the South. Then suddenly it howled. The vibrating VHF antenna produced a low frequency hum I had never heard before and trees ashore whined as the wind crashed into them. An alternate to the packing gland as described in last month's WebLetter is an "O" ring type seal, often spring-loaded and held in place with "C" clips. The compression and lock nut common to the packing type is eliminated. However the shaft log portion, along with the hose and rubber clamps, may be identical. These packing glands are available for single and double seals. Some have a water inlet feature and/or a grease fitting. Theoretically water will not enter a shaft log completely to the packing or seal, as air will be trapped in the shaft hole and log cavity. If there is any seepage in the packing water will re-enter the area, however. Water introduced in the inlet will cool the gland and is often required in high speed craft with low shaft angles, turning at high rpm's. Such glands may also incorporate a grooved bearing to envelope the shaft with water. The resistance of seals is minimal. In electric boats where horsepower is quite low any resistance to the shaft turning is a detriment, thus the seal type gland is excellent for such purposes. The American way is to "build a better mouse trap" and, of course, this relates to shaft water seal methods. We admit our lack of experience with most seal types of these for two reasons. First, and probably foremost, is the cost, which is often double or more of either of the packing type. Secondly, we rely on the experience of a highly regarded builder of electric boats who used several such units to eliminate resistance. They seeped and he later shifted to seal type glands. His opinion: the seal type was cheaper and worked better. A packing type has easily replaceable packing. Loosen the locking nut and packing nut and replace the packing it. The seal type requires uncoupling from the motor, removing the old seals and slipping new ones over the end of the shafting. This may also require dropping the rudder so the shaft can be removed. Then, of course, you must have replacement seals on hand. These are specialty items and may not be available from local boating sources. Thus be sure and carry spares when using a seal type gland. A seal gland takes up less space than the packing type. This can be an advantage when the space between the shaft log and motor coupling is very close; typical with steep shaft angles. The space between the gland and the motor flange coupling must be adequate to replace a packing type, whereas the seal type eliminates the threaded gland. What type of gland or seal is best for your boat? The differences are noted but consider the replacement issue. In an emergency you can replace the packing in a gland with well-oiled shoe laces; of course the gland will leak slightly and won't last long. 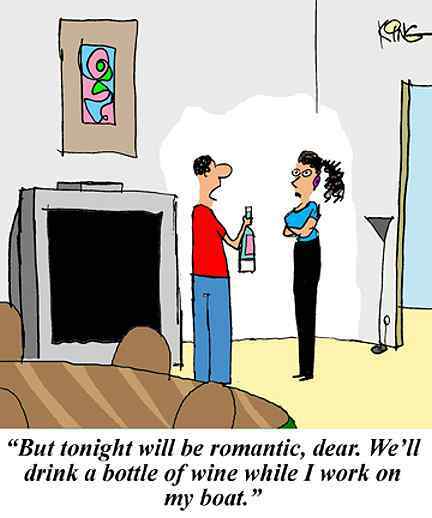 But replacing the seals can be quite a chore. When do you truly enjoy your work? What is it that makes YOU feel good? Is it having a sense of accomplishment? Is it building something out of wood? "A beautiful boat is a thing of joy forever"
"Great things are done by a series of small things brought together. " "Why do you like boatbuilding?" This is a question that's heard a lot, and no doubt you will be asked it, too. In response, we usually mumble something about how we like to work with our hands, or we like the smell of wood, or the atmosphere in our workspace. But we've probably never really been very happy with our answer. Well, guess what? There are actual, clinically verifiable reasons why you and I like boatbuilding, according to Claremont Graduate University's School of Behavioral & Organizational Sciences psychologist Mihaly Csikszentmihalyi (say that 3 times fast! ), and explained in his book, "Flow: The Psychology of the Optimal Experience." See if these "elements of enjoyment" describe your boatbuilding "optimal" experience. You like boatbuilding because it's a challenging task. It's not simple enough to get boring, and it's not complicated enough to create anxiety. Merging of action and awareness. You're just in there doing it. You're not conscious of yourself standing in your shop "boatbuilding." You are simply a part of the process and the boatbuilding happens. Clear goals. You know exactly what you want to build, how you want it to look. How many other things are this clear-cut in your life? Immediate feedback. You look at what you're doing and you know that it's right (or wrong), the joint fits or it doesn't. High degree of concentration. You're absolutely into it. Most things that would distract you go unnoticed. Altered sense of time. I'm not really aware of how much time has passed until my wife comes down to my shop and says, "Are you EVER coming up to dinner?" There are other elements of optimal experience, however you don't have to experience all of them to enjoy boatbuilding. And this sort of analysis can explain why you find happiness in other activities besides boatbuilding. But in reading about "optimal experience," I recognized something that I think applies to most boatbuilders. So the next time someone asks you why you like boatbuilding, you can say, "There are several reasons I like boatbuilding, six of them to be exact. First, it's a challenging task..."
Back in Fairfield, Iowa I was a married student from Sandusky, Ohio. I was on a football scholarship. But being from the Lake Erie territory I was always around boats. I saw your ad in Popular Mechanics back then and the Cracker Box direct-drive boat caught my eye. So I ordered the plans and when I was supposed to be studying I was out in a barn behind the house we rented building the boat. I had an extension cord slung from our back apartment window to the upstairs of the barn for power and when it was time to study my wife would pull the plug in the wall and I would stumble down the stairs in the dark. When I was about ready to graduate I had the problem of how to get that 16' boat out of the second floor of that barn. Well, it just made it and my father-in-law came to Iowa to pick us up and take us back to Ohio where I had a coaching teaching position. I remember going to Crestline, Ohio, and buying a 283 Chevy engine and using all the motor mounts and front-mounted water pump. The shaft rudder and stuffing box I got together. Only had one glitch in the project; at launch I started the engine and the boat went backwards. Still have not lived that down! Got the right direction prop and off I went. Wow, what a ride - I had no skeg on the bottom of the boat so to turn it took me around a big circle. And of course no wake at all. One other incident; I put the boat in at a proper launch in Huron, Ohio, and the river police pulled me over for going too fast. I told the officer that was as slow as it would go in idle. He told me to get the boat out of there and not to come back again and I never did! But wow, the fun I had seeing something I built scream down the lake! And lastly the name of the boat was "R-color-TV." Without your help and fair priced parts I would not have completed the project. Thanks again! Here is our Fancy Free "Merry Anne." She has been in the water 11 yrs. now and still dry and holding up. I've been taking her out of the water every 4 years for paint and bright work. I am writing this letter to tell you a few things about myself. I am married to a most wonderful girl named Louise. We stay on a 2 ½ acre small holding about 10 kilometers from a lovely beach called Melkbosstrand. When I was little I remember my dad built a small rowing boat out of marine plywood and every year during his annual holiday we would pack up our little truck and head off for the lagoon at Hermanus for 3 weeks of fun in the sun. There were very little advanced building materials around at that time and we painted the boat after every annual holiday so that it would be ready for the next one. Later when I was about 10 years old dad built me a beautiful 2-man canoe. I loved that canoe and kept it for many years. 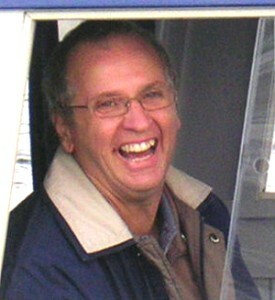 Then life took over and it was not until I was about 50 that I swapped an old lathe for a rather dilapidated speed boat. On the surface it looked okay and I was assured that the outboard motor needed only slight repairs. Alas, the motor was beyond repair and so the boat stood outside under a large pine tree, patiently waiting to receive some Tender Loving Care. It took 10 years before it got any of that TLC, but I have eventually given it some. I decided to put a cabin on the boat because Louise and I both love fishing, but to stay unprotected in our hot sun for too long is a "no-no". I am doing quite well at the project but I have decided that when this project is completed and we have had a bit of fun with the boat, I would like to tackle a project from scratch. I have been greatly inspired by your enthusiasm and I love getting your newsletters and WebLetters. Please keep it up. May you and your family have a happy and prosperous year. I do glean a lot out of the news letters and WebLetters. As a builder (General Contractor) I can relate to a lot of the basics regarding set-up, et cetera. 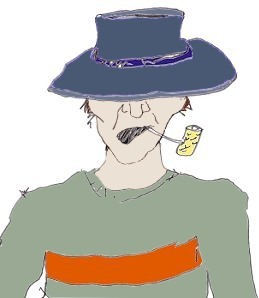 I have been enjoying the Boatbuilder Forum also. 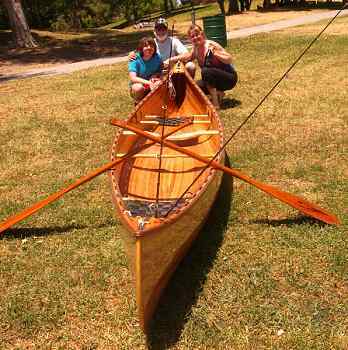 I have enclosed a photo of the canoe I built last summer; of course, I'm the old guy in the middle. While cruising the Internet, I came across your website and it brought back fond memories. In 1957, when I was 21, after corresponding with Glen (the "Glen" in "Glen-L") via letter (which I still have), I ordered the plans for your Squirt (NOMAD) and built it and it turned out beautifully. Two years later (1959) I built your L Dorado (NOMAD II) and it turned out perfectly. Perfect plans that anyone could read and use. It’s nice to see Glen-L is still active. You created a love for boats that I have never lost. Thank you. I’ve always disliked opening up a letter with “To Whom It May Concern” particularly after reading Boat Building 101 so please let me bid you Good Morning and if you would be so kind as to share this with the staff of Glen-L, I’d be very grateful. I read the above article over the course of several hours without putting it down; I’d have to say it was almost like a riveting novel. I’ll also confess that I’m the CEO of a rather busy company and I hid from my daily activities until I completed the last page. Even then I went back and wrung out a few more ounces of wisdom (yep, wisdom is the correct word; see pages 68 & 69 titled Designer’s Notebook: A DIY Company) I suppose it’s partially due to my intrigue with woodworking and my love for boats, but also the author’s uncanny grasp of articulating a difficult subject thru his pen. I’ve spent a fair amount of time rambling around the ‘net looking and researching for the right plans for a 22’ to 24’ classic design runabout (Hacker – Chris etc.) 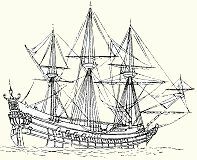 as well as referring to local (Seattle) shipwrights that I’ve known thru the years and I’ve ended up on your cyber doorstep. The bonus here is finding a company whose founder has a wealth of knowledge thru experience, the ability to communicate the knowledge, and has a staff who apparently follow suit. The real kicker here is his (and your) philosophy of DIY (see referenced pages to refresh yourselves). I built my company from scratch by taking on the exact same approach. I have ordered plans for your Monte Carlo and will most likely call next Monday or Tuesday to get some additional information. I truly hope that the person fielding the questions is the gentleman who penned the article.